The Ford Escape is a popular compact SUV that offers a wide range of amenities. Enhance the convenience and comfort of your car purchase with the Escape's panoramic Vista Roof, a heated steering wheel or SiriusXM Satellite Radio with Traffic and Travel Link. 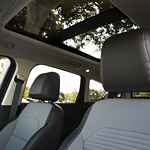 The Ford Escape's panoramic Vista Roof with rear skylight opens fully or tilts up to add more natural light to your vehicle's interior. When you add SiriusXM Satellite Radio with Traffic and Travel Link, you receive over 150 channels of news, entertainment and live sports. Stream all the commercial-free music you can handle when you add the SiriusXM satellite package. Other amenities include electric brake parking, ergonomically correct heated steering wheels and HID headlights. When you test drive a Ford Escape today, explore all its added extras and discover how they can enhance your driving experience. This popular compact SUV's amenities comfortably gets you where you want to go.